The Giant Danio is aptly named because it is two or three times the size of other danios! The Giant Danio Devario aequipinnatus (previously Danio aequipinnatus) is a good-sized cyprinid and larger than other danio species. They can reach a length of almost 6 inches (15 cm) in the wild, though they usually only reach about 4 inches (10 cm) in the aquarium. Most of other danios are only about 1 to 2 inches in length. These danios are the stars of the aquarium with their beautiful markings and bubbly personalities. They are quite spectacular fish to look at and can reflect a surprising range of colors, from greens to blues. Their natural coloring can vary quite a bit, and one less common variety is even partially albino. This morph is commonly known as the Golden Giant Danio, or sometimes the Yellow Giant Danio. The common name "giant danio" sometimes refers to other large danio species. Several of these that were once thought to be Giant Danios are now considered to be their own species. These include the Malabar Danio Devaria malabaricus, Devario affinis, Devario browni, and Devario strigillifer. The Giant Danio is so similar in appearance to the Malabar Danio that even though they originate from separate geographic areas, these two are often confused. Differences are slight, but the Malabar Danio has a moderately deep body while the body of the Giant Danio is less deep. Also, the central horizontal stripe on the Giant Danio doesn't usually extend onto the tail fin, while it may on the Malabar. Although not as hardy as other species, these danios are quite tolerant. They are often used as the first fish in an aquarium to get the system running. Their only real demands are a tank that is spacious with clean, well-aerated water. Their aquarium needs to be at least 30 gallons, and more importantly, 36 inches or longer to allow them to swim freely. They will like some current in the water as they enjoy swimming against it. These lively schooling fish should be kept in a good-sized group of 8 to 10 individuals. They will behave, and misbehave, much like small children do. They will move about ceaselessly, play games with each other, and occasionally squabble over food and space. Keeping them in a large enough school will help to reduce any spats as they tend to form a natural hierarchy with each having a position. Giant Danios are not aggressive fish, but they are quite active and very energetic feeders. Their constant activity can be disruptive to slower swimming fish and shy or smaller tankmates. Good companions are other robust, similarly-sized fish. These include cyprinids like some of the other danios and barbs, loaches, catfish, and even cichlids. Because they are quite quick, these danios are sometimes used in Central and South American cichlid tanks as dither fish. Larger cichlids will chase and defend their territories from these active danios, thus creating a more harmonious environment for other inhabitants that could otherwise be harassed. The Giant Danio Devario aequipinnatus (previously Danio aequipinnatus) was described by McClelland in 1839. They originate from much of northern India and neighboring countries, including Nepal, Bangladesh, Sri Lanka, Myanmar, and northern Thailand. This species is listed on the IUCN Red List as Least Concern (LC). It is common and widespread across its range, and there are no major widespread threats. In nature, these fish inhabit clear, moderately flowing streams and rivers at elevations up to 1000 feet (300 m) above sea level. These waters have varying conditions but are mostly shaded environments with substrates of smooth rocks and gravel, and sometimes with overhanging vegetation. They swim in schools at the surface of the waters and feed mainly on insects and insect larvae. The Giant Danio is an elongated fish with a torpedo-shaped body and a barbel at the end of each lip. One of the largest danios, they can reach lengths of about 6 inches (15 cm) in the wild, though in the aquarium, they usually only reach about 4 inches (10 cm). They have an average lifespan of 5 to 7 years with proper care. These handsome fish can be somewhat variable in color. In general, the background color is an overall grayish hue, cast with yellows and greens. The sides have a bluish green wide stripe with various yellow stripes and spots. The fins get transparent farther from the body and may have a tinting of pink or green. The occasional albino fish may occur in a brood due to a rare genetic mutation. A partial albino color morph is commonly known as the Golden Giant Danio, or sometimes the Yellow Giant Danio. No varieties of the Giant Danio are in existence yet, but a long-fin version is being attempted. Size of fish - inches: 5.9 inches (15.01 cm) - Though they reach about 6 inches (15 cm) in the wild, they usually only reach about 4 inches (10 cm) in the aquarium. Lifespan: 7 years - Their average lifespan is 5 to 7 years. The Giant Danio is a moderately hardy fish and a good choice for the beginning aquarist. They need clean water but are quite durable and can normally fight off most aquarium diseases. They are usually very easy to feed, eating just about anything that is offered as long as it floats at the surface where they can readily consume it. Giant danios are omnivorous and will eat most any prepared or live aquarium fare, though the food does need to float at the surface. As with all danios, these fish are quite active and have high nutrient requirements, so select a flake food that will provide for their needs. In the wild, they pick off insects from the water surface, so they often won’t really chase after food that has left the surface until everything else is gone. These fish will do best when offered food several times a day, but offer what they can eat in 3 minutes or less at each feeding. If you feed only once per day, provide what they can eat in about 5 minutes. These fish are not exceptionally difficult to care for provided that their water is kept clean. At least 25 to 50% of the tank water should be replaced once a month. If the tank is densely stocked, replace 20 to 25% weekly or every other week. Aquariums are closed systems, and regardless of size, all need some maintenance. Over time, decomposing organic matter, nitrates, and phosphate build up and water hardness increases due to evaporation. During maintenance, these fish will jump, so keep a close eye on them. The Giant danio is fairly hardy and will adapt to most aquarium conditions. This schooling species will spend most of its time in the top and middle regions of the tank, particularly if there is open water or water current. They are extremely active swimmers and need open space to swim unobstructed. They will do best in a spacious aquarium of 30 or more gallons. More importantly, they need a long tank of at least 36" or more, so they can swim laps and be active. Provide good filtration with some current, as they enjoy swimming against the water flow. They need highly oxygenated water, so consider adding some air stones. The tank should be covered to prevent jumps. These fish are most comfortable and effectively displayed in tanks with subdued lighting and a dark colored fine gravel or sand substrate. They like well-planted aquariums, and a variety of plants will make them feel safe. Dense, tall plantings around the sides and back are great, but leave lots of open water in the middle of the tank for swimming. Use a few hardy floating plants to create shadows. Minimum Tank Size: 30 gal (114 L) - They need a long aquarium, 36" or more in length, to allow them to swim freely. Breeding Temperature: - Breeding temperatures are 72 to 82° F (25 - 28° C). Water Movement: Strong - Though they don't need torrent conditions, they do enjoy a current to swim against. Water Region: All - They will school in the middle and upper regions, whichever has more open water. The Giant Danio will be agreeable in a group of 8 or more individuals, but in small numbers, they tend to irritate each other. They may harass smaller fish and mildly annoy larger fish but almost never damage either. This behavior is often mistaken for aggression, but to them, it’s just play. Some aquarists resolve this by keeping them in a species tank or in a tank with fish of similar demeanor and size. Giant Danios make poor companions for species that need a slower paced environment. Instead, good tankmates are other robust, similarly sized fish. These include other cyprinids, like some of the danios and barbs, as well as loaches, catfish, and even the more peaceful or semi-aggressive cichlids. It is also advisable to introduce these fish to the aquarium all at once or at least a few individuals at a time as lone newcomers may be bullied. Temperament: Peaceful - This fish has a very big personality. It will chase other fish around, though usually without consequence. Same species - conspecifics: Yes - They are best kept in groups of 8 to 10 or more. New fish should be introduced to the tank at the same time, as later additions may be bullied. Peaceful fish (): Safe - These are a very lively fish, so pick tankmates that will not be disturbed by them. Slow Swimmers & Eaters (): Monitor - These very active fish will make calmer tankmates nervous. 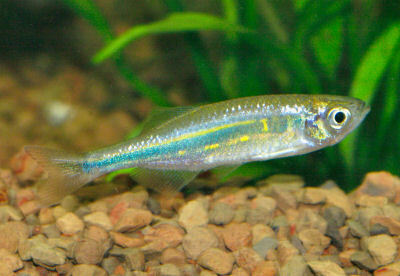 Males are noticeably thinner with more intense coloration. The center blue stripe of a fully mature female will bend upwards at the tail fin, while the male's stripe will be straight. Breeding the Giant Danio is not at all difficult. They are sexually mature when they are about 2 3/4 inches (7 cm) in length. Like other danios, these fish are egg scatterers with no specific breeding site, and they exhibit no parental care for their young. But unlike most of the danio species, they lay adhesive eggs in the manner of the barb species. Once their eggs are scattered in the water column, they will fall towards the substrate but will also adhere to the leaves of plants or other objects. These fish can spawn in a 20-gallon breeding tank with a thicket of dense, bushy plants or a cluster of plastic plants at one end. As the eggs are often released throughout the water column, marbles or pebbles used as substrate will help protect eggs that fall to the bottom. The water should be fresh and clear with a temperature between 72 and 82° F (25 - 28° C). Two fish will form a breeding pair which they sometimes keep for life. Add the female to a separate breeding tank and let her settle for about a day before adding the male. When they are both there, the morning sun hitting the tank will cause the spawning to begin. If conditions are favorable, the female will release her eggs in open water and the male will fertilize. During the spawn, the parents should be fed live worms, to keep them from eating the eggs. The female will release 5 - 20 eggs after each pairing, until up to about 300 eggs are laid. The eggs will scatter, landing on the plants and substrate, and possibly the glass sides of the tank. Keep the eggs oxygenated using an air pump. The eggs will hatch in about one to two days. For the next 3 to 5 days the young will be hang from the plants and glass until the yolk sac is absorbed, and then will become free swimming. At that time or before, parents should either be removed or kept constantly well fed. Feed the free swimming fry powdered dry foods and small live foods. See the description of breeding techniques in: Breeding Freshwater Fish: Barbs. Also see Fish Food for Fry for information about types of foods for raising the young. Giant Danios are extremely hardy and disease is not usually a problem in a well-maintained aquarium. They are primarily susceptible to Ich if good water quality is not provided. Remember that any additions to a tank, such as new fish, plants, substrates, and decorations, can introduce disease. Properly clean or quarantine any new additions to an established tank so as not to upset the balance. The Giant Danio is moderately inexpensive and readily available in stores, online, and through mail order. Hi! I'm really new to being an aquarist, and I decided to bring two giant Danios home with a (cleaned) 10-gallon setup I bought from a thrift shop for cheap. I do have a question about feeding in general...how much is a 'little amount'? To err on the safe side, as I've heard of fish dying from overfeeding so I give them three small meals of around...four large flakes equivalent. Maybe somewhat less than a pinch. Am I giving them enough food, or am I giving them too much? This is my first time and I really want it to be right. Thanks for the help! It sounds like you are doing just fine feeding your fish! I wouldn't worry about overfeeding them too much, as long as you do regular water changes. One pinch 2-3 times a day is a good amount. When i began my aquarium experience several years ago i was as naive as the come i had a 10 gallon tank with a simple H.O.B filter gravel and 2 plants and which was home to a 4 inch baby lake catfish i caught (again naive) i thought it would be a good idea to get him some friends so i added 3 tiger barbs 3 giant danios and 2 red tailed sharks thinking 10 gallons was sufficient i soon found out this was not the case. I proceeded to buy a 29 gallon tank and set it up and add the fish to there new home within 24 hours obviously I had never heard of nitrogen cycle let alone new tank syndrome. so one by one every fish died. that is every fish but the giant danios who also now that they had there own tank proceeded to have baby's so I am convinced that they are an excellent fish for beginners and experienced hobbyist alike. Ps let it be known i have come a LONG way in 3 years. That's a great story Tanner! I'm glad you never gave up, and your fish will give you many years of joy. I have a 190-L freshwater tank with two African featherfin catfisn (Synodonts eupterus) and two jewel cichlids (Hemichromis guttatus). All of them are between 4-6 inches long, and I keep the tank at 27*C and a pH of around 6.3. It is well-planted, with Amazon swords and bunches of Java fern on bogwood. There is black sand as the substrate. For many months now I have been trying to find new fish for the tank, but I have found none that have survived for more than a few weeks. The jewels breed regularly and, during spawning, often attach the Synodontis, but other than that there has been no problems between the cichlids and the featherfins. 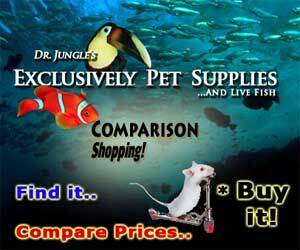 Other fish I have tried include pangasius catfish plecs. I have considered trying African peacocks, but I am concerned about pH being too different for them. Right now I am thinking about giant danios, since they seem large and pretty robust. Would these be suitable tankmates? From the size of your tank and fish, your almost at about the right stocking level. But because your tank sounds to be well established, that could be pushed a bit. However the Jewel Cichlids are very aggressive, especially when breeding, and aquarists say no other fish can survive with them. Giant Danios are hardy and fast but they need a school, around 8 - 10 fish to be happy. Not sure how this will work out, might be better to keep the Jewel's as a species specific setup and do a community in another aquarium. I have discovered my danios like to eat frog eggs and worms.